The holiday season brings with it the newfound excitement of discovering new places whilst making some unforgettable moments. As seen in most cases, travellers tend to visit multiple countries to get the best from a single vacation. This can be challenging as one will be required to arrange for multiple currencies through foreign exchange services and book flights which might turn out to be an expensive affair. Carrying traveller’s cheques and cash of multiple currencies may be expensive as it requires you to pay an extra amount for each encashment. Also, if you lose the traveller’s cheque, it involves a long process to retrieve it. To ensure a safe and convenient journey, it’s best to go paperless with the Borderless Prepaid Card. Above are 4 reasons to invest in a Borderless Prepaid Card when you travel abroad. With so many benefits, travelling cashless as never been this safe, easy and secure. Be a part of this new revolutionary method of travelling. Get your Borderless Prepaid Card today! Planning your holidays abroad? 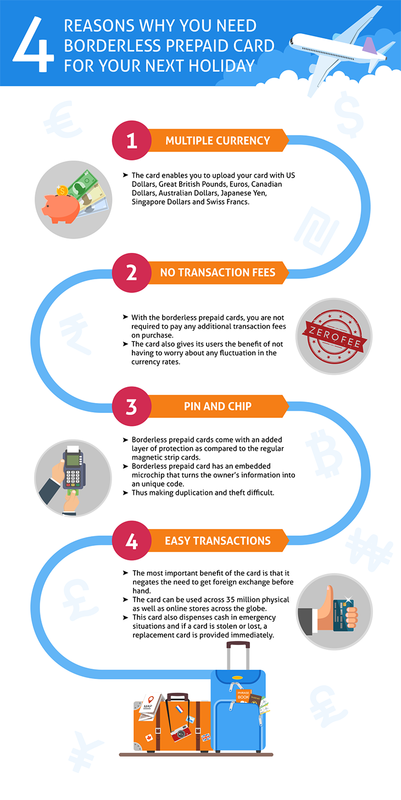 here are few reasons to invest in a Borderless Prepaid Card when you travel abroad.